【mek】Support Software | Products （Support Systems and Software ）| MASS CO., LTD.
Support the central management of multiple AOI’s, calculation and analysis of inspection results. Our support software enables the traceability. User can work without AOI, can create data without stopping line. 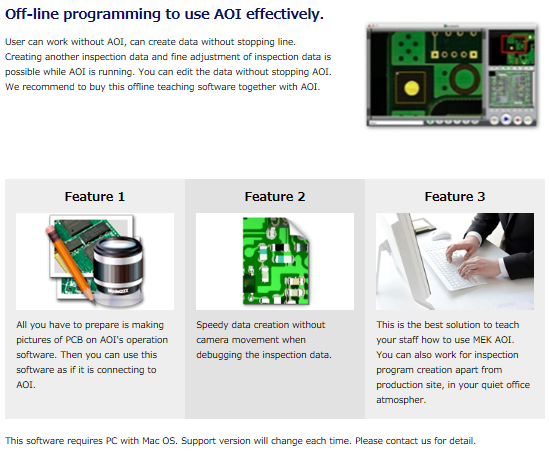 All you have to prepare is making pictures of PCB on AOI’s operation software. Then you can use this software as if it is connecting to AOI. This is the best solution to teach your staff how to use Marantz Electronics AOI. Production management software which collects and manages various data from Mek AOI. It establishes the traceability for production management, and support to improve the quality of production line. System consists of 4 products, and basic software is provided in package. Using Gerber data from CAD, convert it into the data which can read by AOI. Data making efficiency will improve by using this data. It is effective for making the data for solder paste inspection.